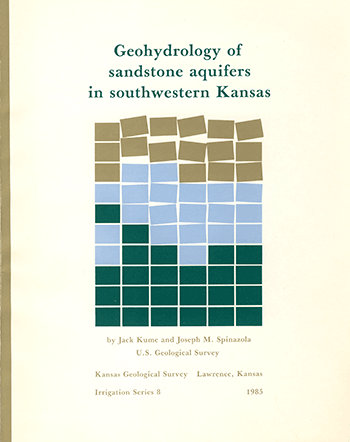 Originally published in 1985 as Kansas Geological Survey Irrigation Series 8. This is, in general, the original text as published. The information has not been updated. The publication is also available as an Acrobat PDF file. Sandstone aquifers in southwestern Kansas are a source of water for irrigation, industrial, municipal, domestic, and stock uses. An appraisal of water resources in sandstone aquifers underlying approximately 17,400 mi2 in 26 counties of southwestern Kansas shows that in some areas water is still available for additional well development. Additional water is needed to supplement decreasing supplies in the overlying Ogallala aquifer as demand for water increases. Major sandstone aquifers, in order of importance, occur in the Dakota Formation in the Lower Cretaceous Series, in undifferentiated rocks in the Upper Jurassic Series, and in the Cheyenne Sandstone in the Lower Cretaceous Series. Minor sandstone aquifers, in stratigraphic sequence, occur in undifferentiated rocks in the Upper Permian Series, in the Kiowa Formation in the Lower Cretaceous Series, and in the Codell Sandstone Member of the Carlile Shale in the Upper Cretaceous Series. Aquifers in the Dakota Formation occur throughout most of the area, contain fresh to moderately saline water, range from 0 to approximately 150 ft in thickness (average 58 ft in thickness), and yield up to 2,200 gal/water/min to wells. Dissolved-solids concentrations are less than 500 mg/L in water from the aquifers in the southern two-thirds of the area. Sodium bicarbonate and calcium bicarbonate are the most common chemical types of water. In some areas, moderate well development has occurred in the aquifers for irrigation, industrial, municipal, domestic, and stock supplies. The aquifers in rocks of Late Jurassic age occur in the western half of the study area, contain freshwater, and range from 0 to approximately 50 ft in thickness (average 24 ft in thickness). Dissolved-solids concentrations in water from aquifers in Upper Jurassic rocks range from 296 to 517 mg/L. Waters are calcium bicarbonate and sodium bicarbonate chemical types. Moderate development of irrigation, stock, and domestic wells has occurred locally in the aquifers. The aquifers in the Cheyenne Sandstone occur throughout most of the area, contain fresh to briny water, and range from 0 to 190 ft in thickness (average 37 ft in thickness). Dissolved-solids concentrations in water range from 192 to 51,000 mg/L. Sodium sulfate or sodium chloride waters are the common chemical types. Minor development of irrigation, stock, and domestic wells has occurred locally in the aquifers. Aquifers in rocks of Permian age occur throughout the area, reach a maximum depth of approximately 2,100 ft in Wallace County, and generally contain saline to briny water. Dissolved-solids concentrations in water range from 89 to 51,000 mg/L. Sodium chloride and calcium sulfate are the common chemical types of water. A minor amount of stock-well development has occurred in the aquifers. Aquifers in the Kiowa Formation and in the Codell Sandstone Member of the Carlile Shale occur in the northeastern corner of the study area, are thin and discontinuous, and have a minor amount of stock- and domestic-well development. The aquifers in the Kiowa Formation range in thickness from 10 to 35 ft, and the aquifers in the Codell Sandstone range in thickness from 0 to approximately 25 ft.
Placed on web June 14, 2013; originally published 1985.